In 1925, in the small, sleepy town of Dayton, TN, there was a trial. A local high school teacher was arrested for teaching the theory of evolution to some of his science students. And soon two of the greatest public speakers in the country were coming to battle it out. Did J. T. Scopes break the law by teaching evolution? Was the law constitutional in the first place? Hundreds of people crammed into the sleepy little town and the trial had lasting effects on many of them. 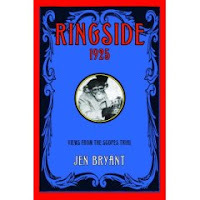 Jen Bryant has written a novel in verse that shows the trial through the eyes of some of the people affected by it. The narrators include Marybeth Dodd, a high school student whose father thinks a woman's place is in the home; Willy Amos, an African-American boy who taught himself to read and write because he's not allowed to go to school; Jimmy Lee Davis, a high school student whose mother has taught him to follow the teachings of the Bible; and Peter Sykes, Jimmy's best friend... or he was until their differing opinions on the trial drove them apart. Each narrator has a distinct voice and takes something different away from the trial. Seeing the trial through so many different points of view really brings it to life. intention of replacing the Holy Book. if you use both, it makes a better jam." I was hooked from that poem on. The verses paint a picture of a small Southern town and the people who live and work in it. I thought the whole thing was gorgeous and I loved reading from every character's point of view. I think that kids with some background information about the Scopes trial and evolution might get more out of this book. Most of the characters are high schoolers and adults, each dealing with their changing (or staunchly unchanging) attitudes in a different way. Another great novel about the Scopes trial is Monkey Town: The Summer of the Scopes Trial by Ronald Kidd. Also check out Evolution, Me, and Other Freaks of Nature by Robin Brande. Why on earth didn't I blog my review? Other good title on this event is Kidd's Monkey Town. A few liberties are taken with the facts, but it's still an interesting perspective on what happened.